Went to Zion National Park for the first time on a plein-air painting trip. Wow it was gorgeous! 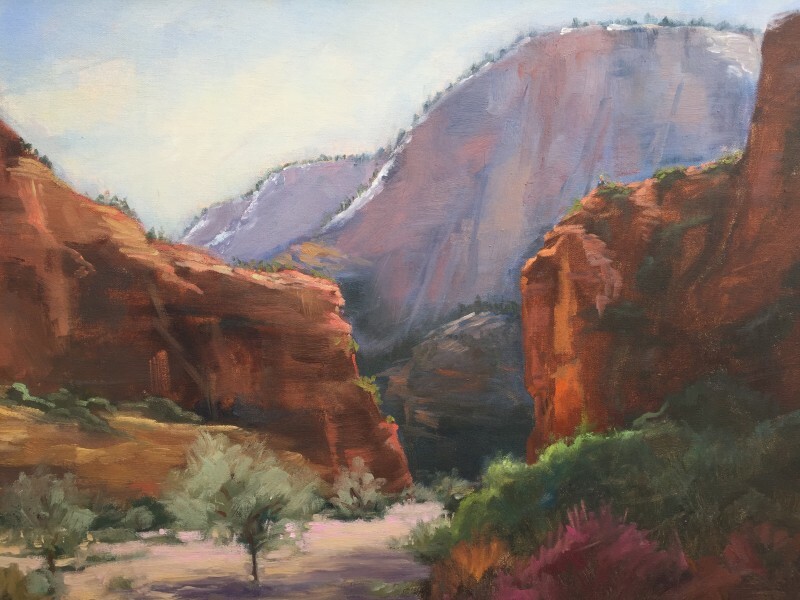 I was painting so I didn’t go on any hiking trails, but there are lots of YouTube videos on the many trails and hope to hike when I go back. Really beautiful campground right in the entrance of the canyon. 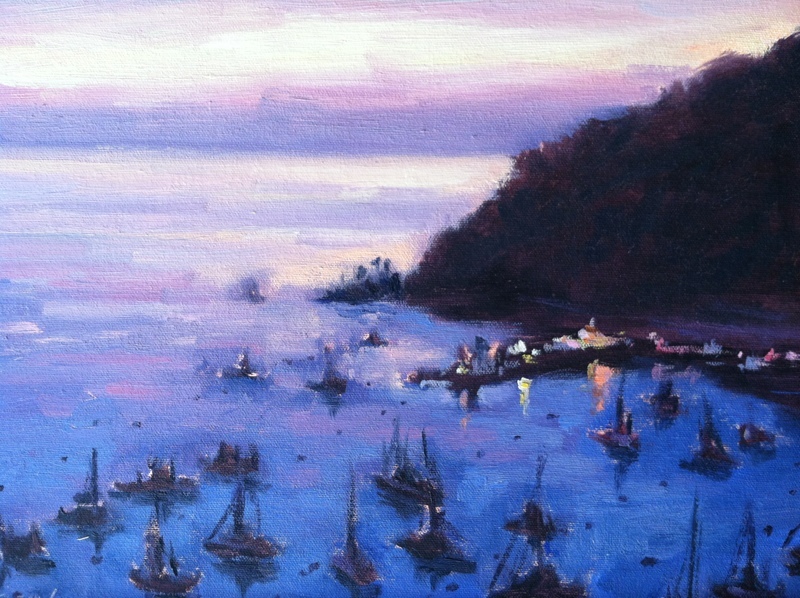 As a painter there are scenes everywhere to paint, one more gorgeous than the next. Stayed at Bubbleberry Inn in Springdale, Utah. 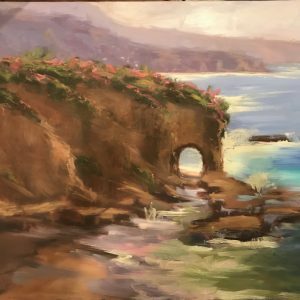 The two paintings in this post are of the same scene; a small “on location” painting and then I used that for color reference to paint large one from photo. 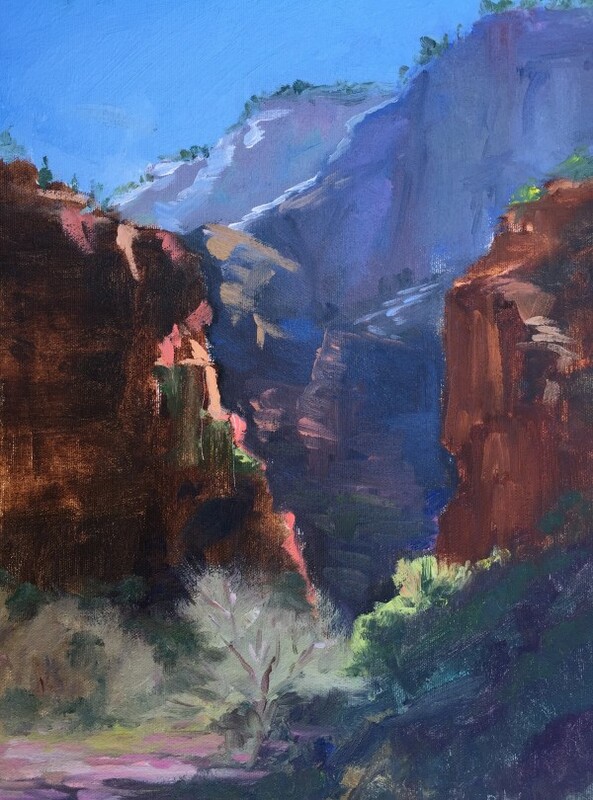 There is gorgeousness everywhere in Zion so I felt a little overwhelmed trying the find “thee” perfect location to paint! “Make a #%** decision woman!” I said to myself. This spot was relatively close to a bathroom so decision made! Walking around the location this scene struck me with its slivers of light hitting the cliffs. 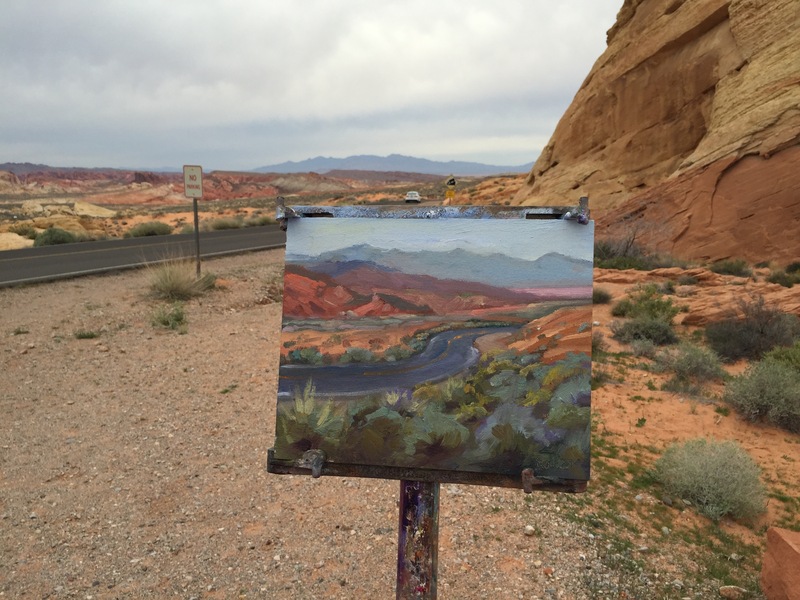 And the company of other painters and birds singing made it an absolutely lovely experience…. 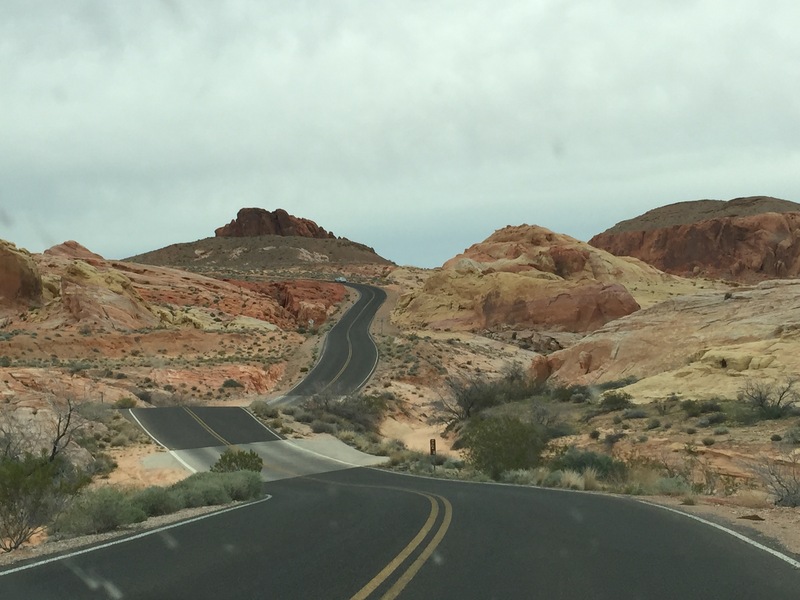 So where do you get good coffee in Springdale, Utah? Deep Creek coffee has excellent lattes, scones, and fresh juice. For groceries we went to Sol Foods which had amazing veggie soup daily in the deli in the back of the store. Lots of cute shops on the main drag in town. Can’t wait to go back! Amazing rock formations at state park in Nevada. Little two lane road takes you all over the park. Feels like you are at a amusement park but the “amusement” is all nature and rocks. The deeper into the park the more amazing. 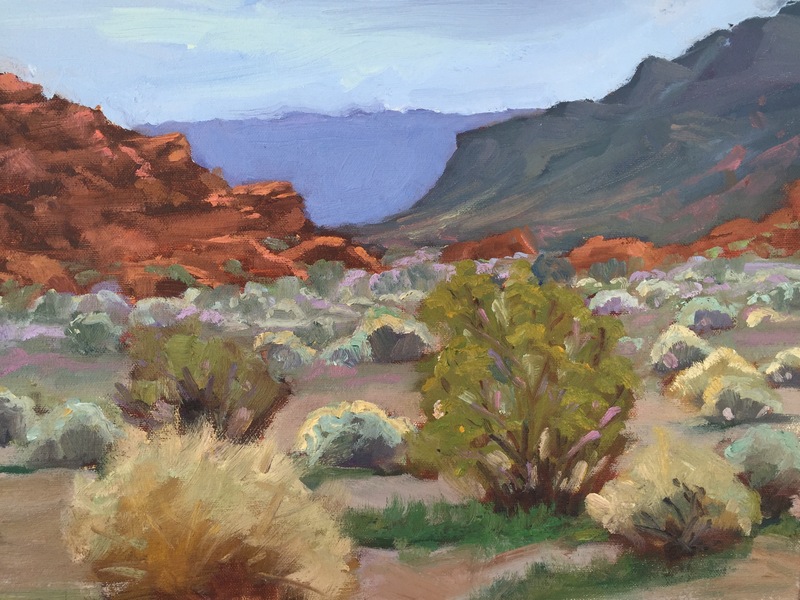 I painted 3 on location and took some photos so plan to paint some larger canvases of this location. Gorgeous scenic state park can’t wait to go back. 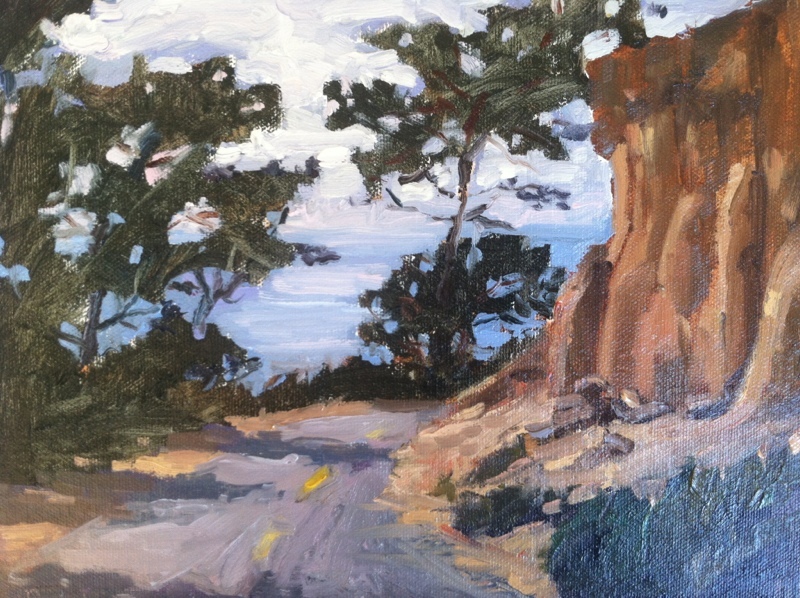 Original oil of Big Sur, Ca. 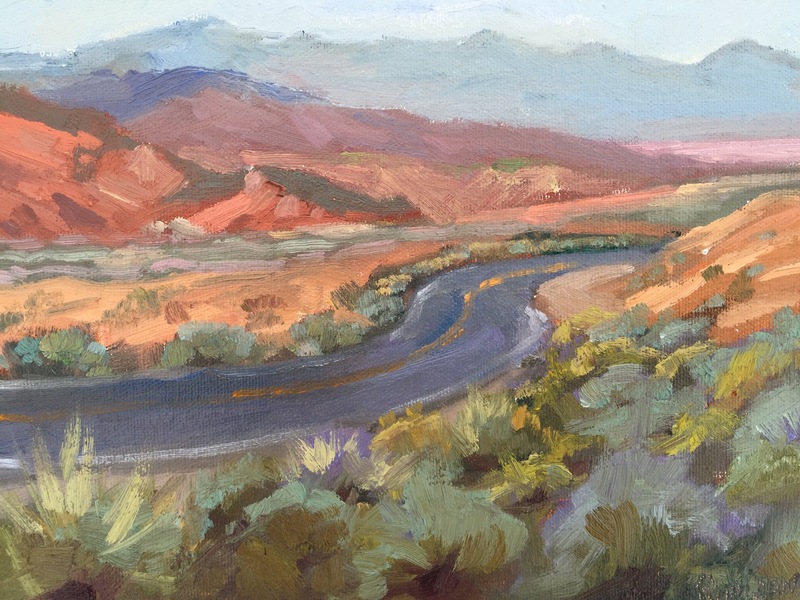 This painting was painted from small studies on location and photo reference. 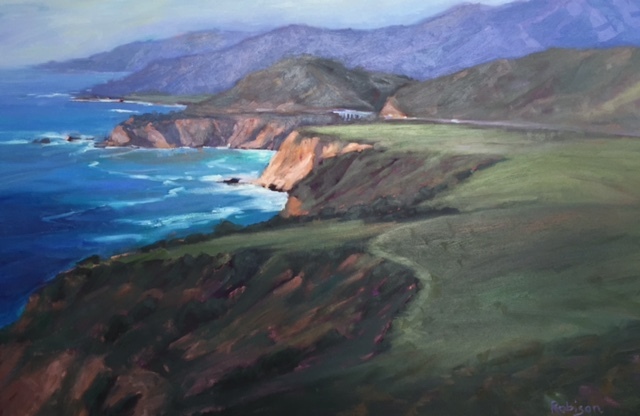 This piece depicts the quintessential northern California cliffs of Big Sur. 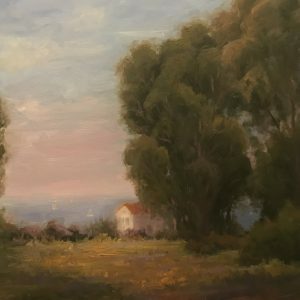 Big lush green pastures and brushstrokes give this piece a feeling of grandeur. 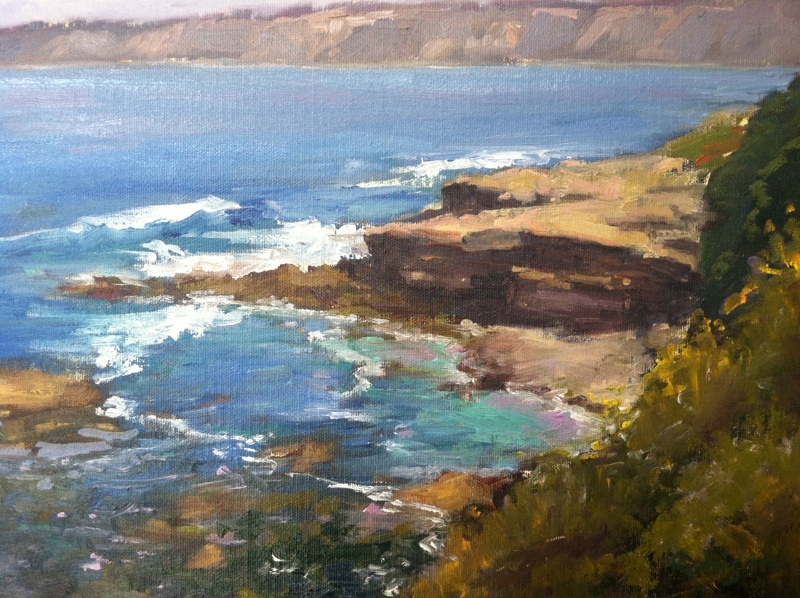 Done in the plein air style this landscape capturing the beautiful pastures of coastal cliffs. The perfect time of day! Certain times of day can transport you in a meditative way to another place and time. 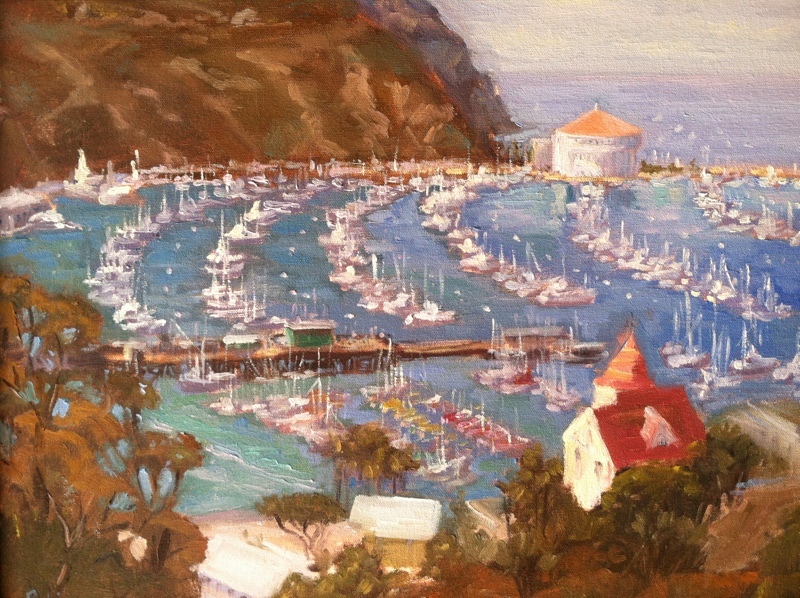 This Catalina scene remains me of my Irish ancestry. On my mother side they were from Cobh, Ireland. 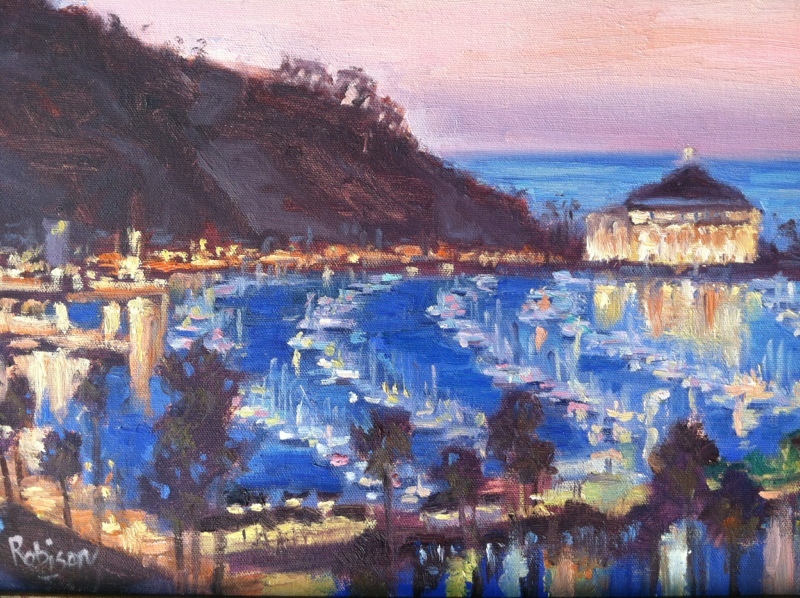 It’s a town on the south east side with a small cove and harbor a lot like Catalina in that the hilleside meets the sea and the town is all about the harbor. A must see town with great Bed and Breakfasts. Twinkling white, yellow, and gold lights………lit like a Christmas tree! 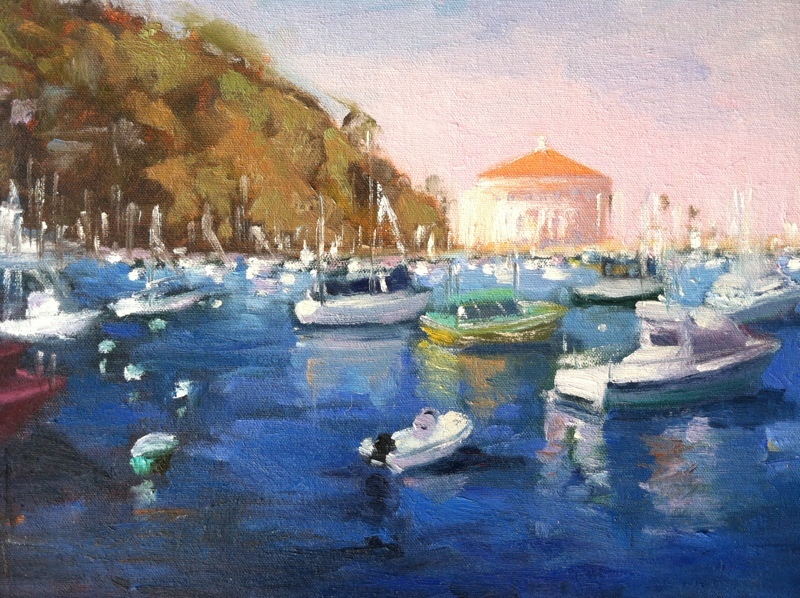 Recently spent time in Catalina. I always forget when away for a while how blue and gorgeous the water is. A pretty little cove. We found a great cafe with a delicious Indian cauliflower potato soup…..I think its Cafe Metropole…..or something like that. No Starbucks on Catalina, but at C.C. Gallagher they make a delicious soy latte! They also have yummy deserts. 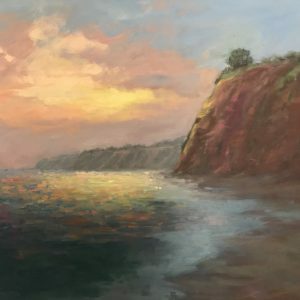 Torrey Pines State Park is a great place to hike. Amazing views of ocean and beach through the pines. Beautiful coastal setting in San Diego, California. 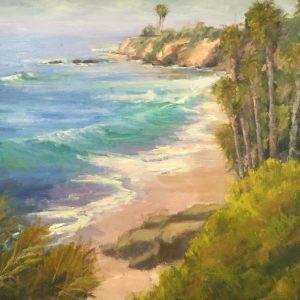 The smell of the pines and ocean together is intoxicating? A must see for all travelers. 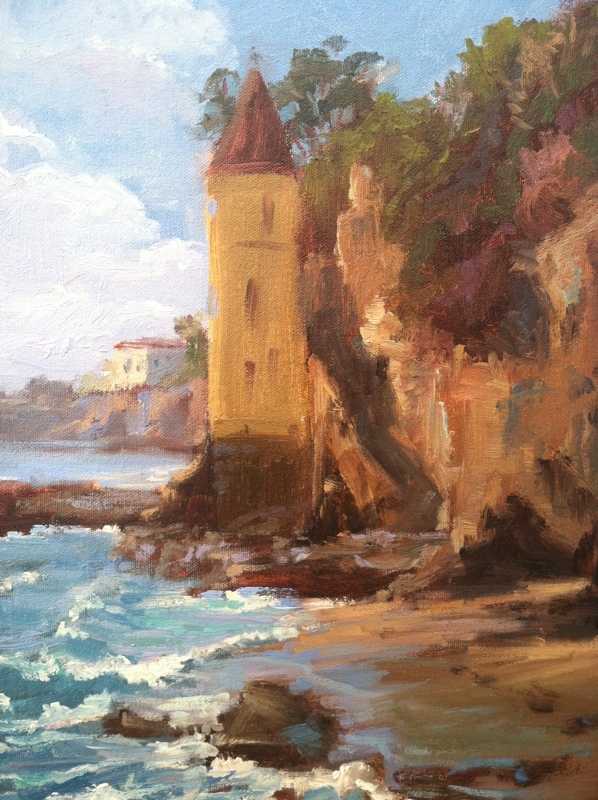 Victoria Beach in south Laguna Beach has this old castle-ish looking structure built into the rock/cliff. Gives a medieval feeling to the sunny Laguna cove. 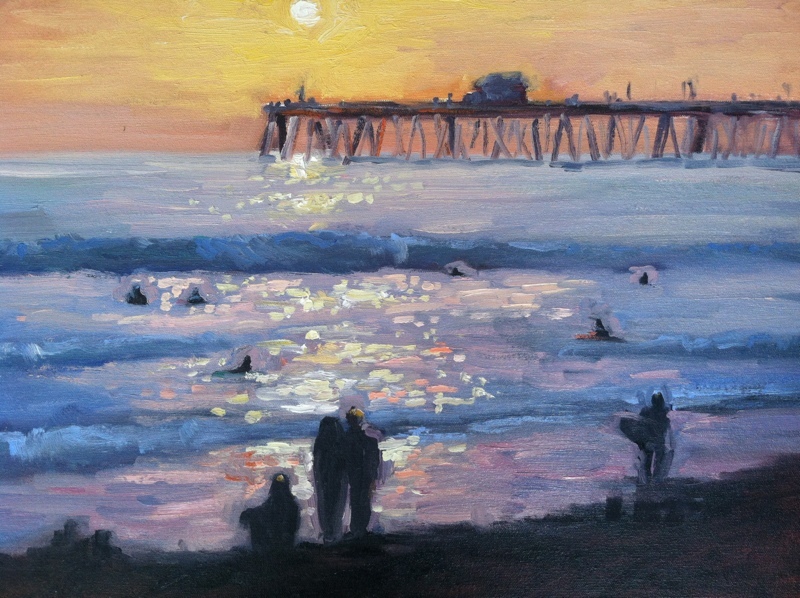 The tide was so high this day we had to wait for surf to go back out before getting to the painting spot. Lots of beach attendees enjoying the coves this day. Girl with longboard coming out of the water at San Onofre State Beach, San Clemente, Ca. 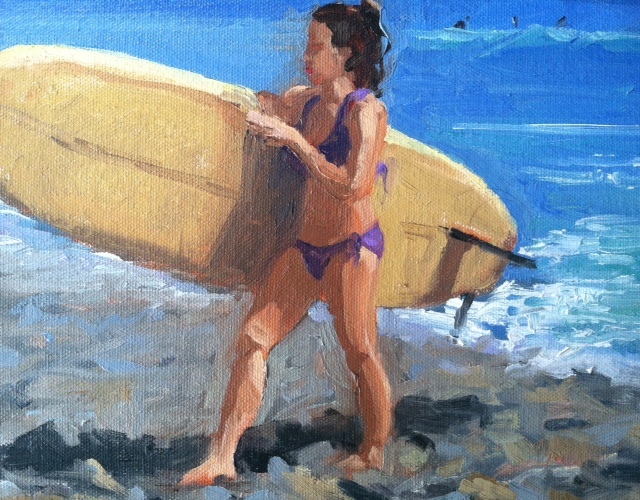 The girl in this painting looked too small for the big board, but boy did she shred the gnar a few times. 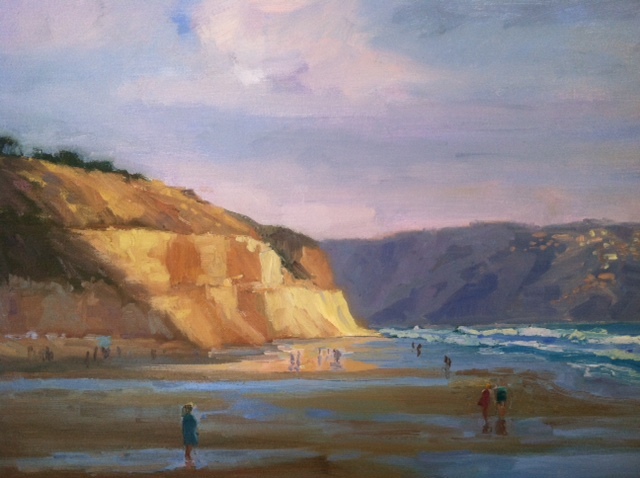 This scene of Torrey Pines State Beach is a depiction of light hitting the hillside just before sunset. 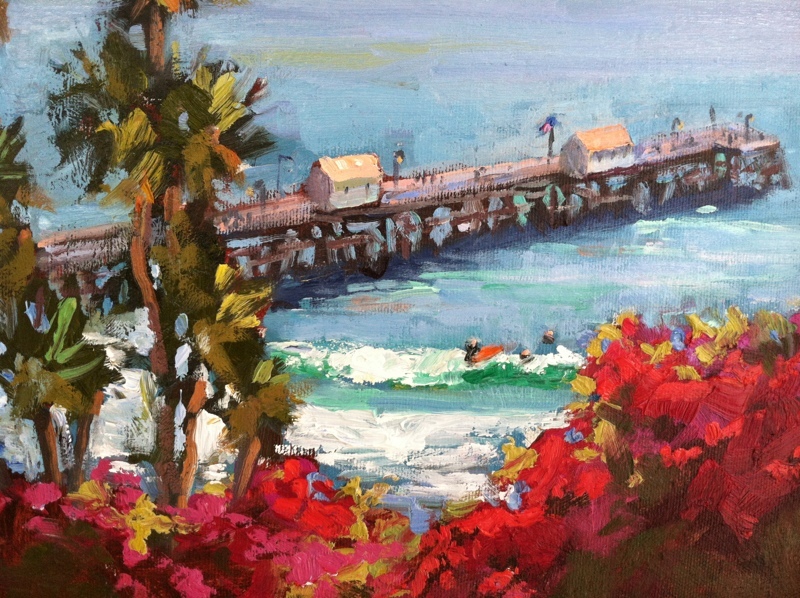 Gorgeous view of the pier through bougainvillea’s at Casa Romantica in San Clemente, California. Clear beautiful day with get surf! 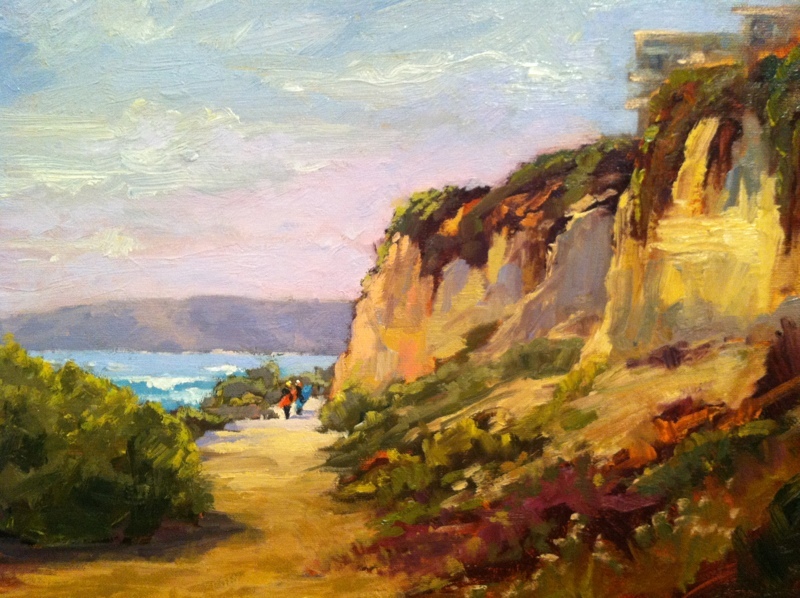 Painting of beach trail at califia state beach in San Clemente.
. 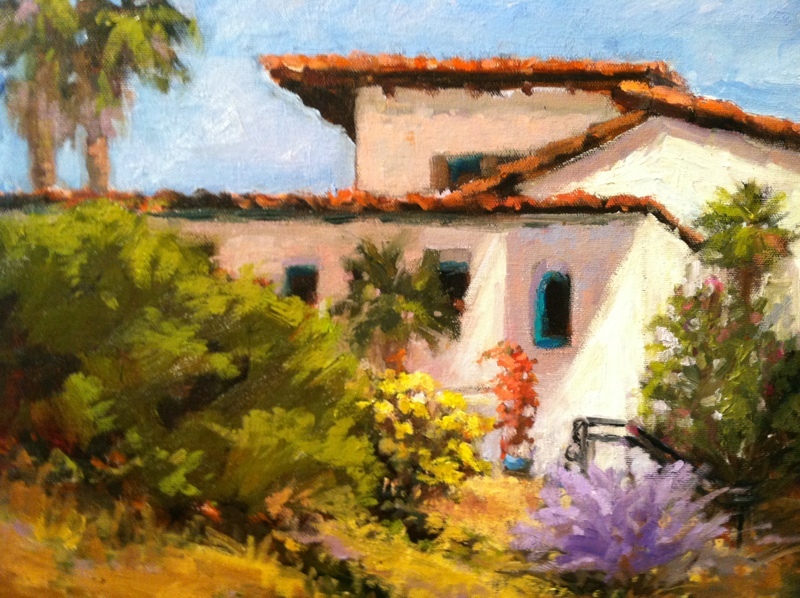 Painted at Casa Romantic for Paint San Clemente. 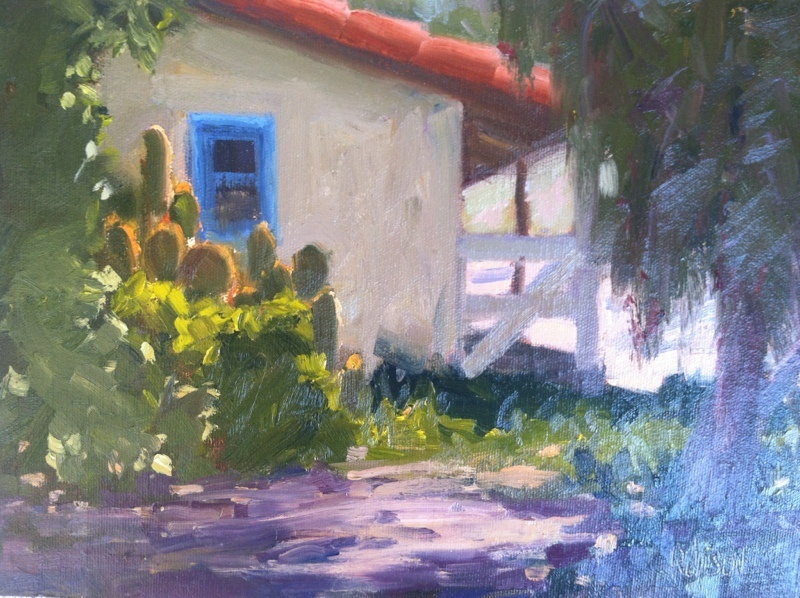 It was a cloudy day but half way through the painting the sun came through and this beautiful light hit the side of the casa. 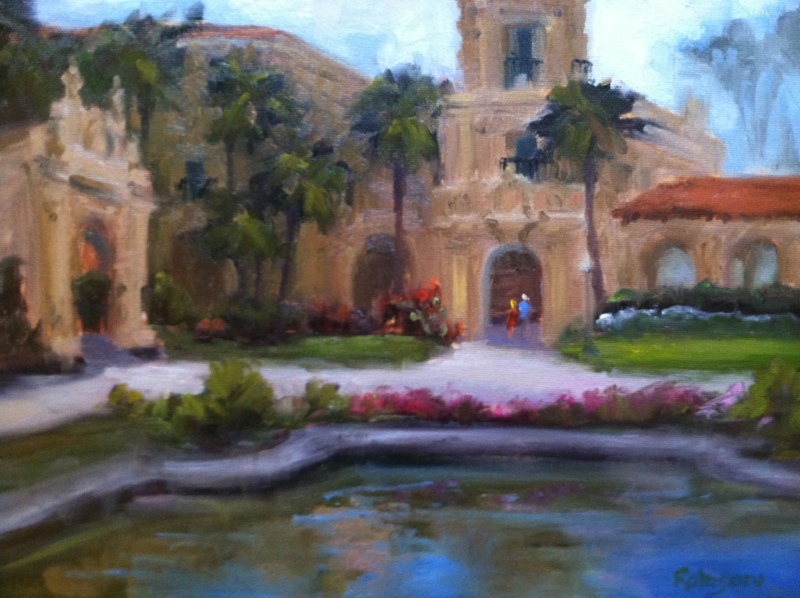 Plein air study of the reflecting pool at Balboa Park, San Diego. Rusty old tractor was fun to paint at the steam engine museum. 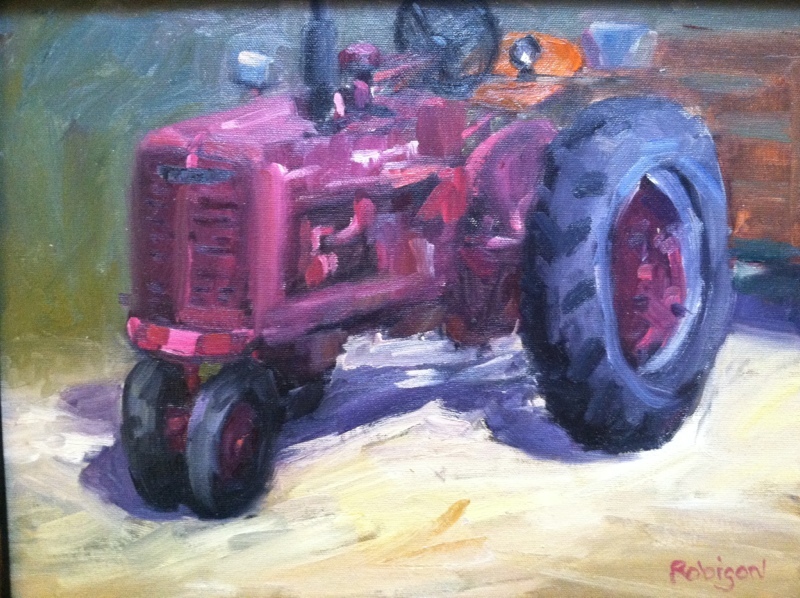 The contrast between the pink warn paint and heavy metal tractor gives this piece a feeling of nostalgia. 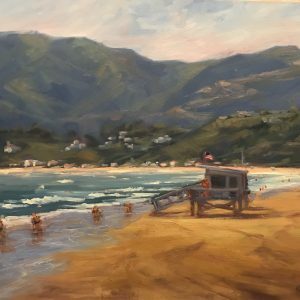 Painting of a 1926 cottage/bungalow need San Diego, Ca. The sky was pink this sunset. Pure pink. 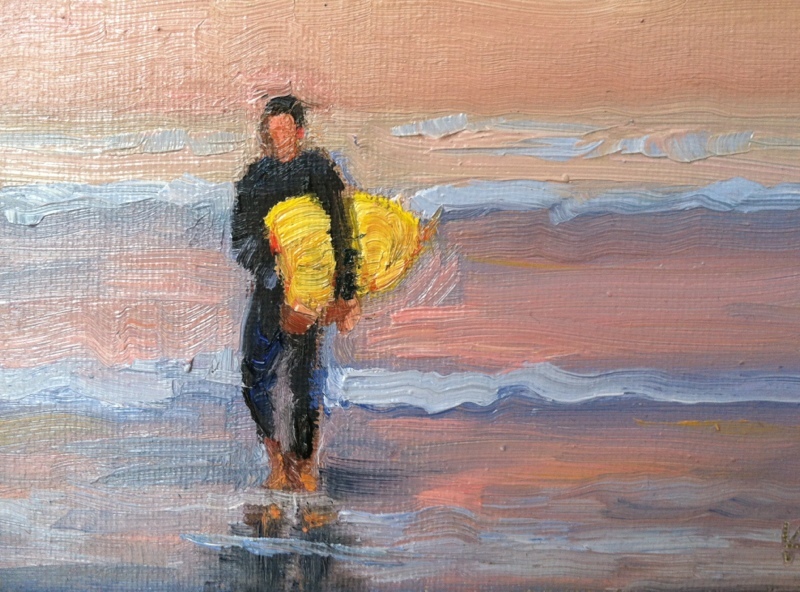 Surfers look so completely relaxed walking out of the water.